Another interesting day. We packed up and left Bacharach for Worms. 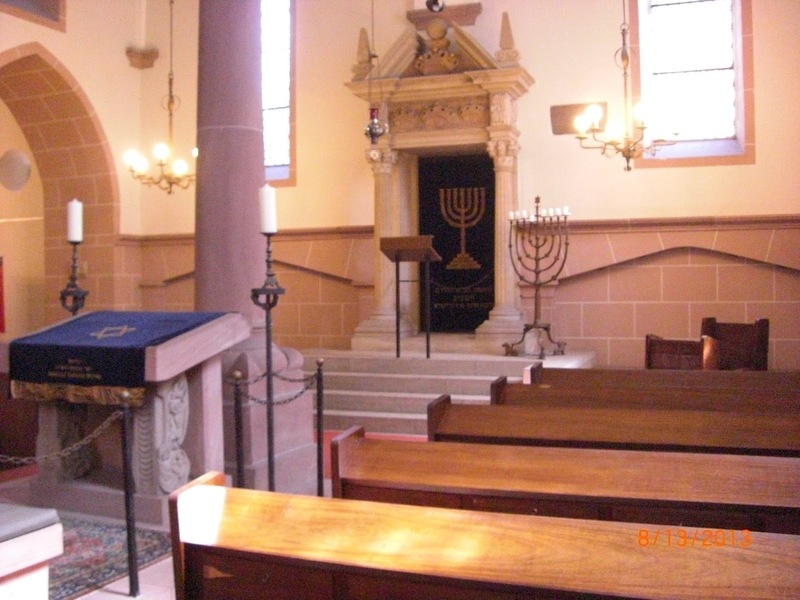 Worms was one of the first three Jewish settlements in Germany. The drive there lasted about an hour, but it wasn't easy getting around Worms when we got to the city. There was a lot of construction and traffic, just like in all of Germany. Once we got our barrings, we went to the old Jewish cemetery, which dates back to the 11th century. The graves were built to last. The German Jews really thought they'd be here until the end of time. After getting to the tourist information booth, we were directed towards the old Jewish quarter of the town, which included the oldest synagogue in all of Germany. The synagogue was also where the famous medieval rabbi Rashi studied. While waiting for the synagogue/museum to open back up after lunch, we came across an Israeli tour group, which was fun. The museum opened, and we took a few minutes to walk around the sanctuary. One experience we had in Worms was rather memorable. 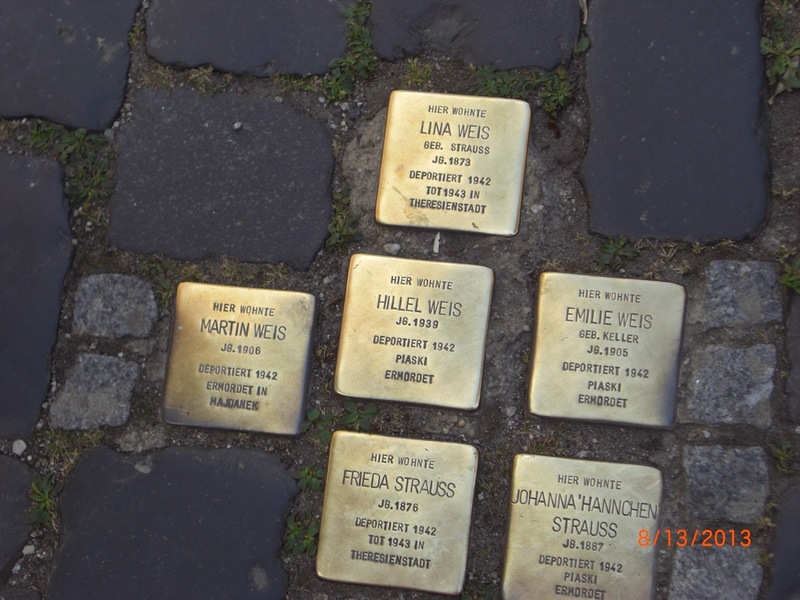 On one of the streets in the Jewish quarter, there were six stolpersteins (shown on the left). Four of them were of a small family, and then another family of two. There was one for a two-year old child. It really showed how expansive Nazi power was and how they infiltrated these seemingly quiet, peaceful little towns. .
We finished up in Worms and left for our one-night stay in Otterberg, as is was close to Kaiserslautern, where dad and I were going to a soccer game that night. 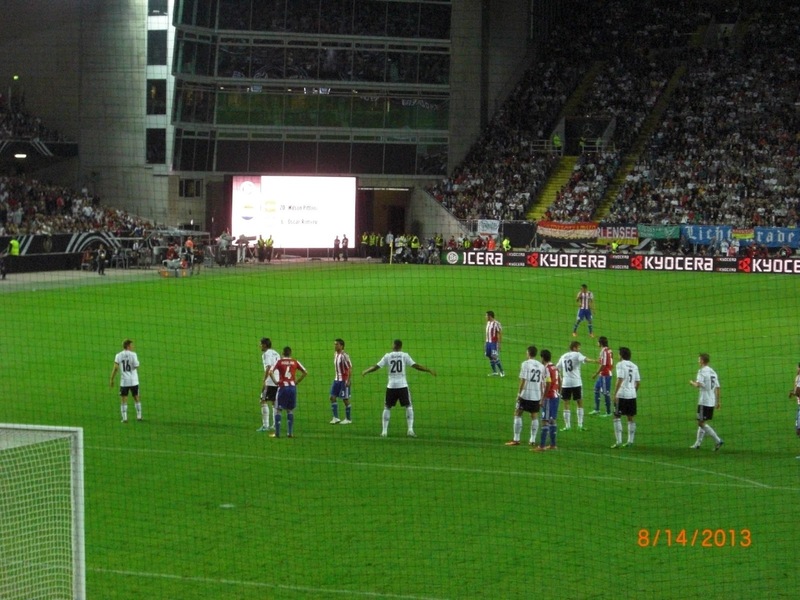 Germany was playing Paraguay in a friendly in preparation for World Cup qualifying, which starts soon. Once we got to Otterberg, we got doner kabobs again for lunch, the third time on the trip. Those places are everywhere in Germany. Then we found out that there would, conveniently, be a shuttle service from our hotel to the stadium that night. With the owner of the hotel and two other people, we set of for Kaiserslautern at 6:30. The driver dropped the four of us off at a bus station near the stadium. The other two other guys spoke little English, but helped us out with directions to the stadium. One even bought us beers on the way in. As we walked up a big hill to Fritz-Walter Stadion, dad and I bought a scarf and a Deutschland hat for just 15 euros. Pretty good deal. 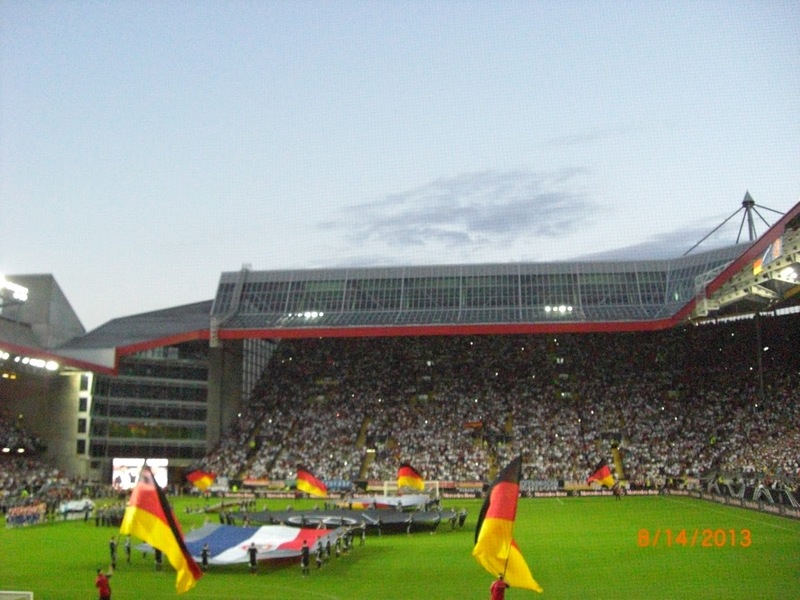 Once we walked in the stadium, we walked around and I got a green road Germany jersey for just 30 euros. Its original price was 79 euros, so we got quite the deal. It took a while to find our seats because no one spoke any English. When we finally did, there was about a half hour before the scheduled kickoff. In front of our seats were pieces of white construction paper. At first, we thought they were going to be used to distract Paraguay on offense. But then, as the German national anthem began to play, everyone around us put them up. We figured out that we were helping to make the German coat of arms. The playing of the anthem was a little emotional, given its history and the irony of our being there. The game was a lot of fun, definitely a great experience. Paraguay, the big underdogs, scored two goals to start the game. There was an overwhelming feeling of “this isn't supposed to happen.” Germany came back to score two goals and tie the game, but Paraguay took a 3-2 lead into halftime. Germany scored to tie it up with fifteen minutes left. Then they had plenty of opportunities to win in stoppage time, but couldn't and it ended in a tie. It was quite the anticlimactic finish. We then made our way back to the hotel in Otterberg and quickly went to sleep. This is a great post. I like this topic.This site has lots of advantage. It helps me in many ways.Thanks for posting this again.